Lotsa Puppies anxious to join your menagerie! 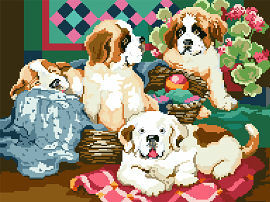 Totally irresistible; hold onto your heart as you stitch these colorful St. Bernard characters! This design by Linda Gillum for Kooler Design Studio is rich in color and imagery and the perfect design for dog lovers.